Woo hoo~ Today 10 July is National Piña Colada Day! Piña Colada is a famous cocktail originating from Puerto Rico, made with rum, coconut cream/coconut milk and pineapple juice. It was claimed that the bartender of Caribe Hilton Hotel’s Beachcomber Bar, Ramón “Monchito” Marrero Pérez, was the creator of this cocktail in 1954. Another restaurant owner, Ramón Portas Mingot, claimed that he created it in 1963 in his Barrachina Restaurant. 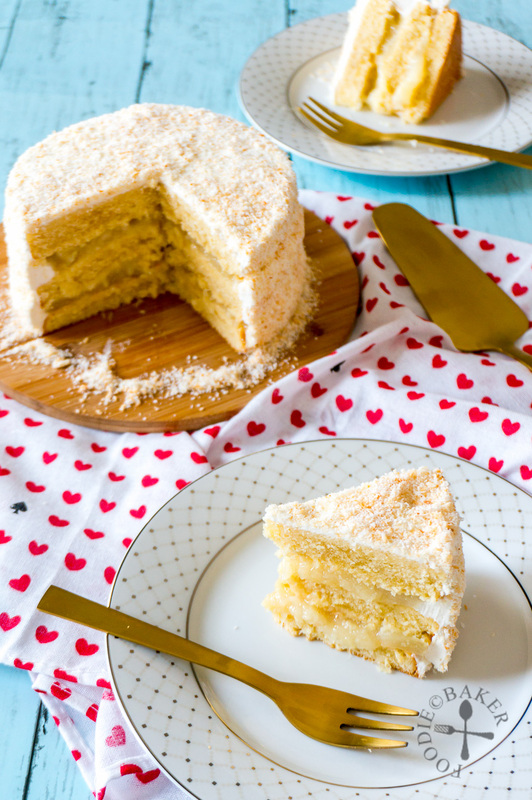 To be honest, I’ve never had a Piña Colada cocktail and since I don’t have the right ingredients to make a Piña Colada cocktail to celebrate this day, let’s celebrate it with cake! 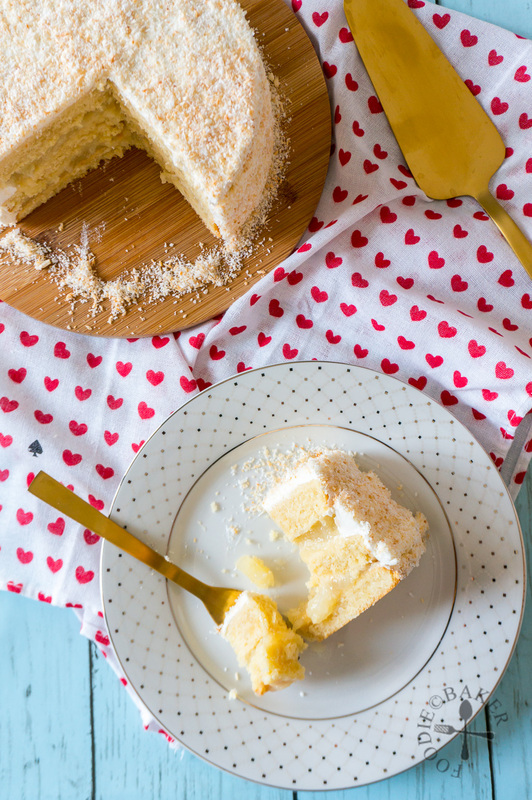 This Piña Colada cake consists of an egg yolk butter cake which I adapted from Rose Levy Beranbaum’s The Cake Bible. I divided the cake batter among three cake tins to get three small cake layers (5-inch big per cake). 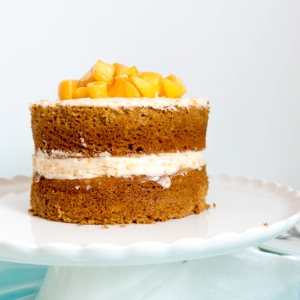 The cake layers are then soaked in a rum-canned pineapple syrup before being assembled for a rum-y kick. I chose to make an egg yolk cake as the leftover egg whites can be used to make a Swiss Meringue Buttercream to frost the exterior of the cake. The buttercream was flavoured with a little rum but it’s not very obvious. Decided to make the step-by-step photos into GIFs as there’s a lot of them this time round, hopefully it’s more useful! If you’d like to see the original GIFs, just click on the images! Enjoy a slice of the cake! Before I leave you with the recipe, here are some other non-chocolate layered cakes on the blog! See all layered cakes on Foodie Baker here! Preheat oven to 175C / 350F. Spread the desiccated coconut on a baking sheet and bake for 10 to 15 minutes, stirring every 5 minutes, until the coconut is golden brown. Remove from oven and set aside to cool completely. Preheat oven to 175C / 350F. Butter three 5-inch cake tins, line the bottom of the tins with greaseproof paper, butter the parchment paper and flour the tins. Set aside. Whisk egg yolks, 1 tablespoon milk, rum and vanilla in a small bowl. Set aside. In a separate large mixing bowl, whisk together flour, cornstarch, sugar, baking powder and salt. Add in 90 grams milk and butter. 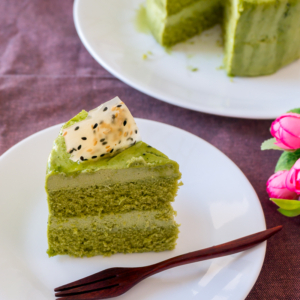 Using a handheld electric mixer, beat on medium speed for 1½ minutes to aerate the batter. Scrape down the batter occasionally from the sides of the bowl with a spatula. Add in the egg yolk mixture in three parts, beating well on medium speed for 30 seconds and scraping the sides of the bowl after each addition. Divide the cake batter among the three cake tins. Bake for 20 to 30 minutes until a skewer inserted into the centre of the cake comes out clean. Let the cake cool in the tin completely before filling and frosting. If your pineapple comes diced instead of crushed, blend with a blender to make the pineapple into very small pieces (or use a knife to chop them finely). Combine pineapple, pineapple syrup (or pineapple juice) and cornstarch in a small pot. Stir with a silicon spatula until the cornstarch has fully dissolved. Cook the mixture on medium-high heat, stirring constantly, until the mixture boils, reduce and thicken. Draw the rubber silicon spatula across the bottom of the pot - the mixture should be thick enough to part, expose the bottom of the pot, and take a few seconds to come back together again. Remove from heat and set aside to cool completely before using. It will continue to thicken as it cools. Combine pineapple syrup (or pineapple juice) and rum together. Make sure your butter is soft and diced before you start the recipe - you should be able to press into the butter easily with your finger but it shouldn't look glossy. Get ready a small pot and a heatproof mixing bowl that can fit snugly on the small pot. Fill the small pot with water until the surface of the water is 1-inch away from the bottom of the mixing bowl. Bring the water to a boil and turn down to a simmer. Remove the mixing bowl from the pot of simmering water and using an electric hand mixer (a stand mixer won't work as the quantity is too little), whisk the mixture on medium speed until it forms a stiff meringue. Continue beating on low speed until the meringue has cooled down - the mixing bowl should be barely warm to the touch. Turn the mixer speed up to medium again and add in the diced butter tablespoonful by tablespoonful, beating until the butter has been incorporated before adding the next spoonful. Once all the butter has been added in, keep beating until the mixture comes together into a nice-looking buttercream. Turn the speed down to low and beat in the rum. Unmould the cake layers. Slice off the top if needed to ensure a flat layer. Brush both sides of the cake layers with Syrup. Place a 5-inch cake board (trim it to 5-inch if possible) on a cake-decorating turntable. Dab the middle of the cake board with a bit of the Swiss Meringue Buttercream and place a cake layer on the cake board (to glue the cake onto the cake board). Transfer 1 cup of Swiss Meringue Buttercream into a piping bag. Snip off the tip and pipe a ring of buttercream around the cake layer to hold in the Pineapple Filling. 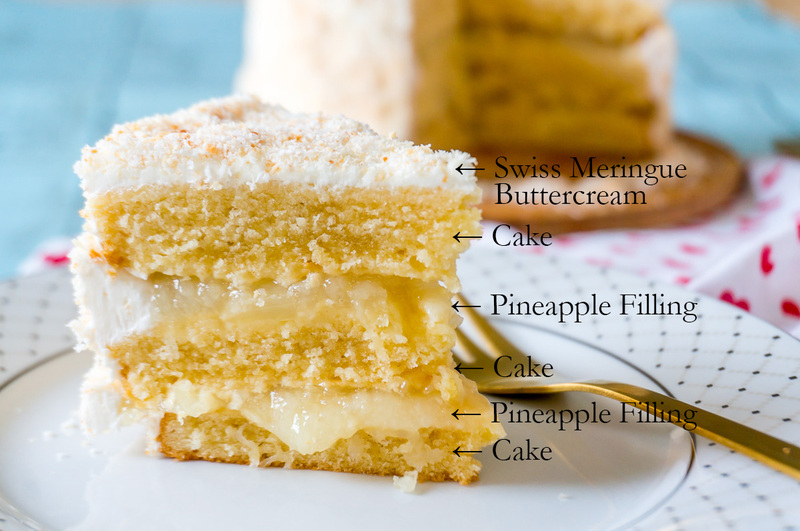 Spread half of the Pineapple Filling onto the cake layer. Place the second cake layer on top and press down very gently. Repeat, ending with the third cake layer on top. 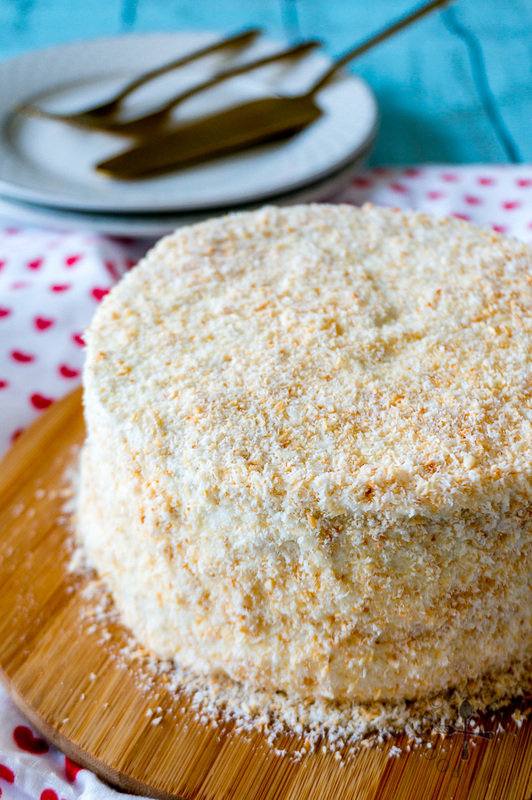 Spread a very thin layer of buttercream all around the cake (crumb coat) and freeze the cake for 15 minutes to set the cake. Spread the remaining buttercream all around the cake (you may have leftover buttercream if you spread only a thin layer). Lift up the cake (with the cake board). 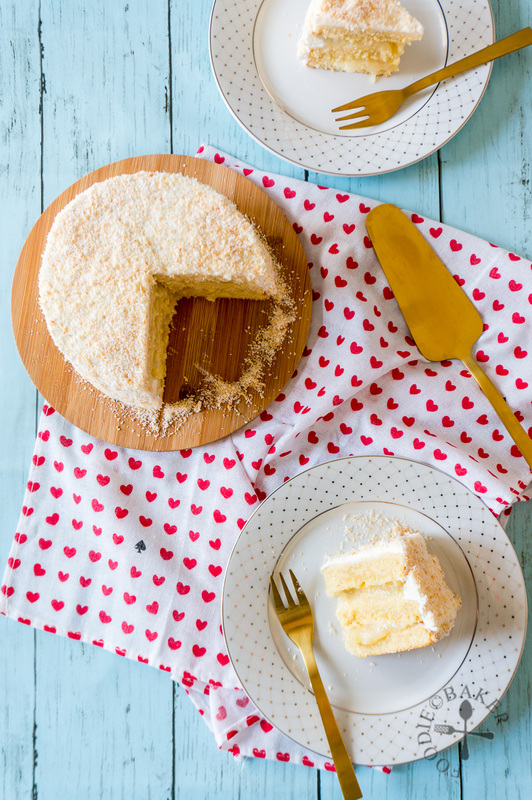 Hold the cake in your dominant hand and use the other hand to apply the desiccated coconut on the sides and top of the cake, pressing down very gently so that the coconut will adhere to the buttercream. Refrigerate the cake until ready to serve - the cake is best on the day it's made. Let it sit at room temperature for 15 to 20 minutes before serving. Thank you Hannah! Love the way you described the cake! Wow this cake is a great way to celebrate the cocktail it looks so pretty and super tasty. Thank you Emma! Sorry for the late approval of your comment, I just found it in spam!